There were no signs of the recent floods during the day we spent gallivanting through Bangkok. We had decided to take some time off from our beach vacation in Koh Samui to soak up some culture and food in this captivating city. Our hotel, the Royal Orchid Sheraton, was located right on the banks of the Chao Praya River, giving us the flexibility of choosing between a taxi, tuk-tuk or a riverboat. 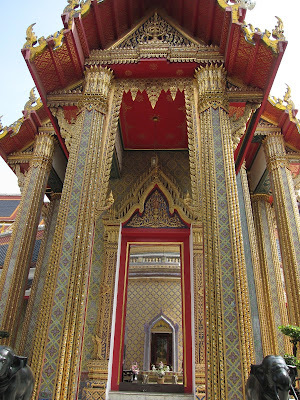 In addition to the Grand Palace and Wat Phra Kaew - which I have visited before - we took a diversion to some other temples off the beaten path. Wat Ratchabhopit, a temple dedicated to the Buddha, was a-glitter with gold and red motifs. Far away from the tourist hordes, this temple provided us a peaceful oasis from which to admire the thought and intricate workmanship that went into building Thai temples, many of which such as this one is a combination of influences - local Thai, other Asian and European. This temple is co-located with the Royal mausoleum containing the ashes of the Queen, daughters and concubines of King Rama V who built this temple complex. The manager of the temple complex gladly gave us a detailed tour of the temple, explaining the significance of the different Buddha statues. 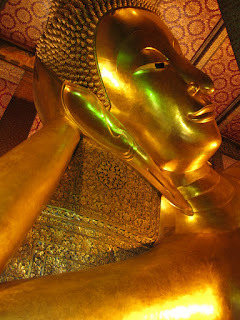 It was here I learnt about the Buddha's different postures that are associated with days of the week. Thai devotees prefer to keep images of the Buddha that represent their birth weekdays. The posture for Sundays has the Buddha standing with his hands down in front of his body, while Mondays has him standing with his right hand raised palm outside. And so on. Gems have special meaning in Thailand too. Rubies from Thailand are very popular the world over, but beware the scam artists when in Bangkok. In fact, if a friendly tourist policeman at the Grand Palace helpfully points you to a different place followed by a tour to the 'famous' Royal Factory' which is selling rubies and gemstones for a discount only on this day, it is most surely another scam. Unless you are an expert at gems, stay clear of expensive stones in Bangkok. 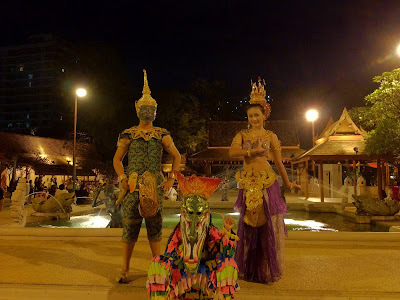 The cultural highlight of our visit to Bangkok was clearly the Siam Niramit theater. We strongly recommend this to anyone who hasn't experienced this show before. Siam Niramit is a lavish spectacle put together with the panache of a Las Vegas extravaganza. 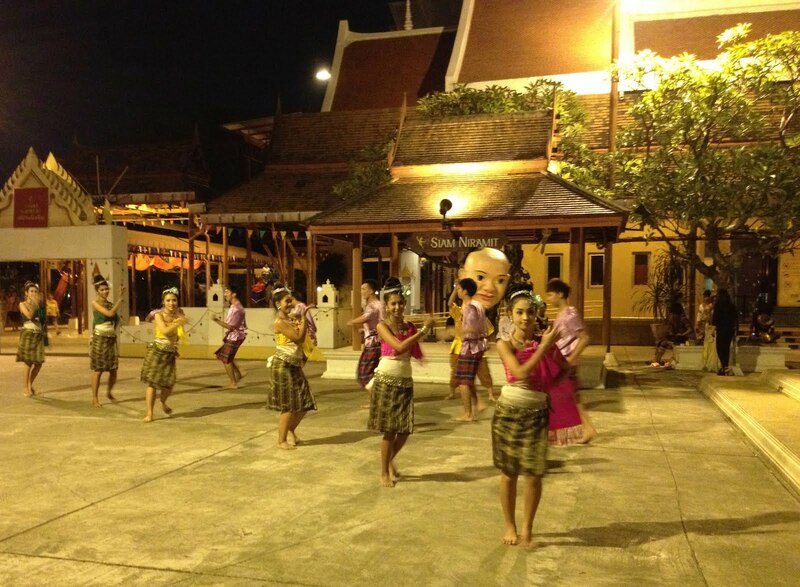 The show begins at 8 PM, but gates open at 5:30 PM for visitors to get a little taste of Thai history and culture through street-side performances and live displays of village life. There is also a great buffet restaurant to sample the cuisine right on-site. The show covers Thailands history: the ancient kingdom of Lanna in the North, the traders who came in from the South Seas, the heritage of the Khymer kingdom and Ayuttaya, the mighty capital in the central Plains. The show ends with depictions of their common beliefs in the Laws of Karma and the worlds of Hell, Himapan - gateway to the heavens, and Heaven itself. All throughout this trip, we tasted some of the very best in Thai cuisine. Even the 'regular' Thai curries tasted so much more better in the country of its origin. We always ended up ordering more food than we could finish in our eagerness to taste everything! Bangkok posts from my previous trip here: Siamese Wonders, Snapshots, More Goodness, A Dinner to Remember. Nice post.It will act as a good guide for travellers visiting Thailand.For staying at wonderful hotels while travelling India visit Shimla hotels .